Place all ingredients in the drum of a small food processor/electric blender and whiz until smooth. 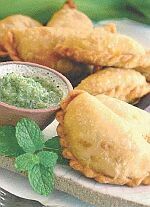 Serve in a small bowl with the curry puffs. Chutney can also be made a couple of hours ahead and kept refrigerated.